What if you recorded every meeting and any employee could watch and listen later? Or if you wrote an email complaining about another employee, that person was immediately cc’ed so that both parties would be forced into a conversation? How would your communication change? While these may seem like wild ideas, these are policies at Bridgewater Associates and Google, respectively. When extreme honesty is put into practice, people communicate directly with each other, don’t spend time politicking, spinning, or backstabbing and other negative behaviours are reduced. Harvard development specialist, Robert Kegan, has noted that in most workplaces, these activities make up a second job as people work to hide their weaknesses and manage the impression colleagues have of them. They also can destroy a company’s culture or create one where efficiencies are lost due employees focusing on protecting their reputation and hiding any perceived shortcomings or bad ideas. This notion of extreme honesty can terrify management. It’s important to note that extreme honesty does not mean being mean or cruel. It’s meant to challenge opinions so that people can examine their own viewpoints and subject opinions to critical examination. Often people have judgements about others that are wrong but there is never an opportunity for an open dialogue for them to express or challenge that opinion. By using extreme honesty, those conversations are forced to happen. The basic principle behind this argument is that not all employees are trustworthy. If you don’t trust your employees, why did you hire them? Many organizations treat knowledge as power so when that knowledge is available to all, insecure people will feel as though they have lost their power or competitive edge. Instead, see it as a way to ensure the best possible ideas and solutions will be presented because they fully understand what other departments are working on and how decisions are made. When senior management meets, is it just the CEO giving orders not caring about the opinions of others? Is there a bully on the senior leadership team that bulldozes through their own ideas and agenda? Employees want to believe that there is a lively debate of all ideas before a decision is made and the decision has the best possible outcome for all stakeholders. When they hear how decisions are made, will they lose their faith in senior management? If you are fearful about the reaction employees would have, it’s time to re-examine how decisions are made. This is a big one! People hate feeling vulnerable. Theoretically, they want to know their weaknesses and what other people think of them, but when they actually hear it, it can be hard not to have hurt feelings or to lash out at the person giving the feedback. You must have independent thinking and humility to deal with knowing weaknesses and seeing mistakes. The key is to make it a safe space where weaknesses are not something to ignore but another trait that makes every individual unique and contributes to who they are. Extreme honesty can’t be implemented half-heartedly. For instance, if you implemented taped meetings inconsistently, employees will either feel spied on or that there is something management hiding from them. Or, if only some employees are punished for speaking ill about colleagues behind their back, employees will feel like there is a hierarchy, and that some employee’s opinions are more valid and less prone to scrutiny. The extreme honesty methodology is often a 180-degree shift in thinking for many organizations. 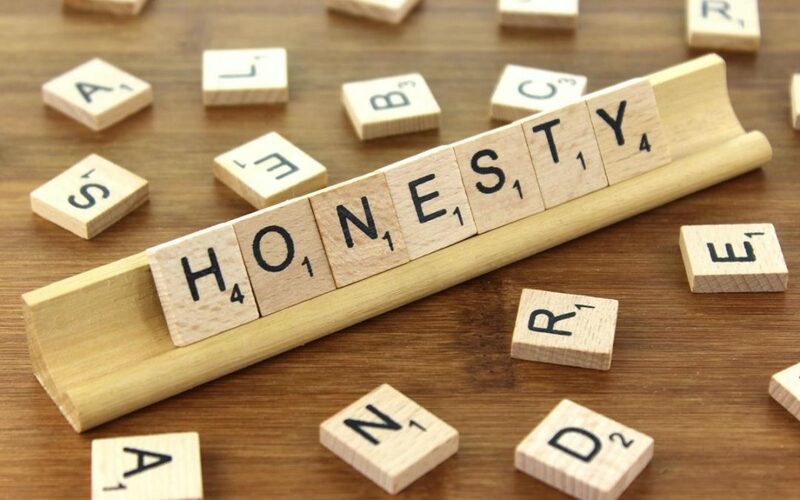 In implementing extreme honesty expect some initial backlash as your employees probably don’t know how to have honest and open communication as this is not a skill that is regularly taught or practiced. In the end, having open and truthful communication, and having everyone understand what is really going on leads to a competitive advantage. How does your organization encourage open and honest communication? Would you be willing to implement extreme honesty?